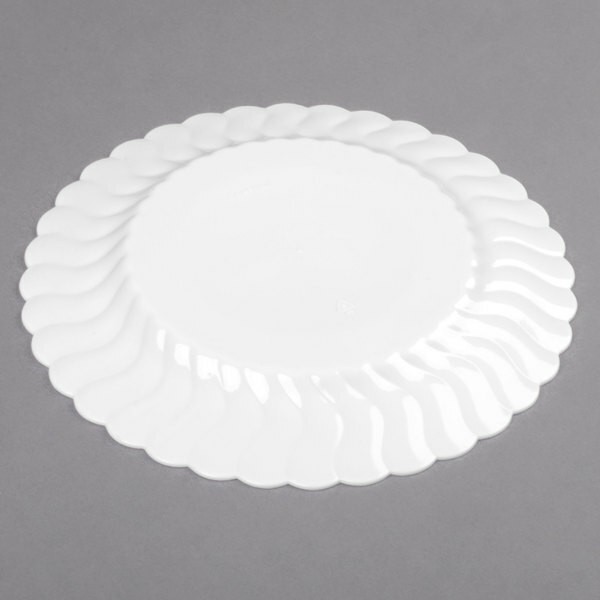 Add style and sophistication to your special event, party, or banquet with this Fineline Flairware 206-WH 7 1/2" white plastic plate! 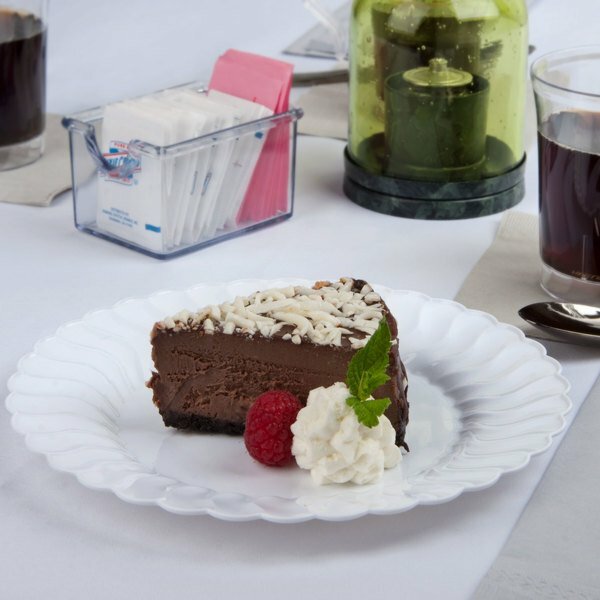 Perfect for your restaurant, cafe, or catering service, this 7 1/2" plate is just the right size for appetizers, hors d'oeuvres, and sides. 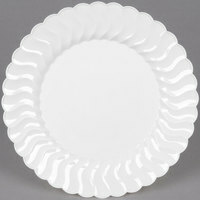 Featuring scalloped edges and a wide rim, this plate's elegant design and white color adds a unique flair to anything you're serving. The perfect backdrop for a variety of occasions, it's also great for cookies, cheese and crackers, and shrimp cocktail! "These plates are very useful for almost any party or event. I like the plates so much that I ordered more for my next upcoming event." Made with style and elegance in mind, this plate has a beautiful scallop edge that accentuates your appetizers, desserts, and sides. The definitive design of the Flairware collection is subtle and smart to provide your guests with an experience they will remember. Stop wasting time on cleanup and washing dishes. With this plate, clean up is fast to save you time and money on labor costs. After use, simply recycle or throw this plate away! Made of durable plastic, this plate won't flex or bend when loaded up with food. 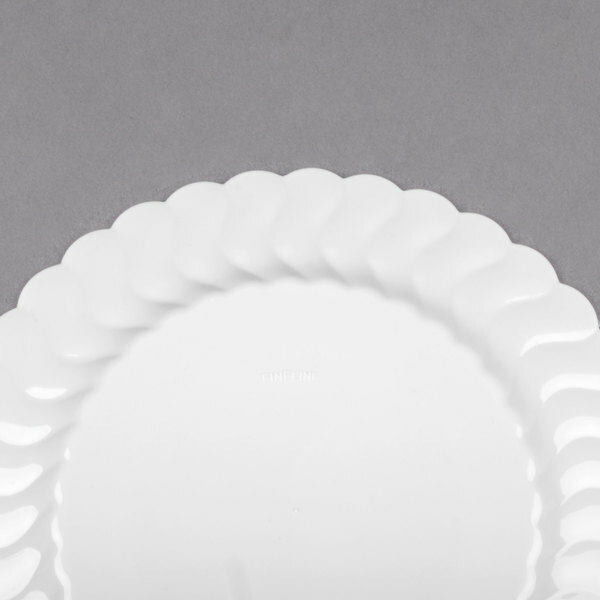 This sturdy plastic gives this plate a high-quality feel compared to other disposable plates. 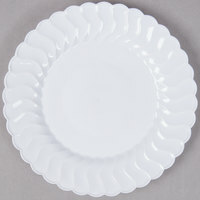 I absolutely adore these Fineline Flairware white plastic plates. I ordered them for my wedding and they match my vintage theme very nicely. I ordered the dessert plates, salad plates and dinner plates - all came looking exactly as described. Shipment came in earlier then I have expected which i was very excited about!! Thank you webstaurantstore!! A great product that I highly recommend. 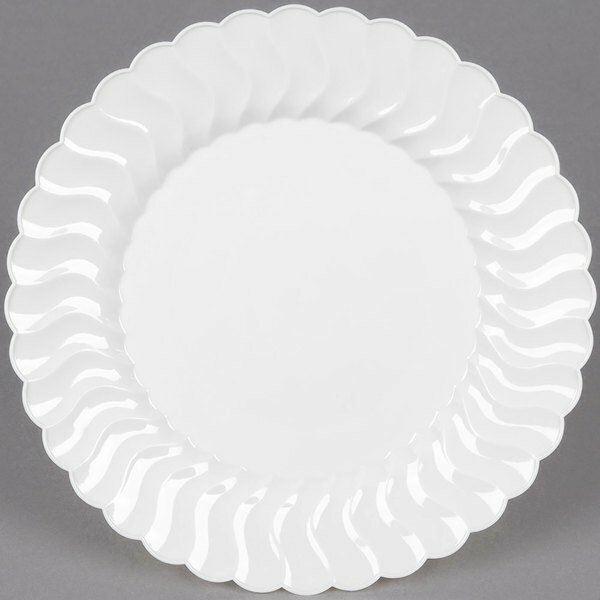 I used these plates at my wedding and I was thrilled with the elegance and sturdiness of the plate. Plus, the fact that it is disposable made clean up a breeze. I love these plates, they look like real China very elegant classy and they are so thick and hard they are very sturdy you could Powell a lot of things up on him and never worry about the plate collapsing. I believe my guess love them so much and more impressed they did not want to throw them away . I actually am coming back to buy more for a function that I am having in a couple weeks You to will be truly amazed! I ordered the 6" and 10" plates for our wedding buffet style food... really didn't need these for anything but wanted them anyway. Such a smart purchase! We used these just about every day in the home for ourselves and for guest! Perfect look and weight! These plates were nice, if a bit plasticky (well, that IS what they are made of). I didn't feel that it made a good enough impression to justify the price; there are fancier looking plates at this budget point. They are also fairly brittle, be careful how you handle them. Ideal plate for desserts or snacks. I bought 3 styles to try out in order to determine the one my daughter and I liked best for her wedding in August, 2016. Although we decided to buy one of the other styles, this little plate has been the most durable for hand washing and multiple reuses the past 9 months. 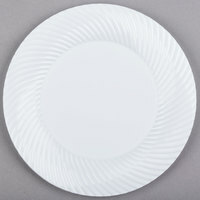 It is solid white with a decorative fluted edge which helps hold items on the plate. It can easily handle a heavy piece of cake or a club sandwich. These plates are very useful for almost any party or event. I like the plates so much that I ordered more for my next upcoming event. These plates are beautiful. They are exactly what I need for the occasion. I am now ordering the case to be able to use for all my guest. I used these plates for the desserts. I paired them with the 10.5 inch dinner plates and the 9 inch plates for the salad bar. It was so nice to have everything coordinated in this product line. Perfect for salads. Nice looking and lightweight. Great price for the quality. I use them all the time and guests love them. A bit small for a lunch plate, but perfect for desserts. I bought the Flairware set for my wedding and I am more than pleased with them. Super quality, very thick and durable. They look just like real fine china! See my review under the Flairware 10.25" plates (144 count) for full details and descriptions of them.